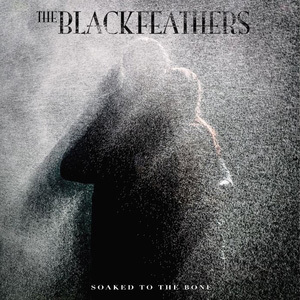 If you've ever had the pleasure of catching a Black Feathers live performance, or indeed wrapped your aural devices around their sumptuous debut EP, then you'll no doubt be eagerly anticipating the duo's first full album release "Soaked To The Bone". Well let me tell you right here (right now) at the outset, that it's inception has been mightily worth the wait. Like their shows, this album is mesmerising and stunning in equal measure. 11 songs in total, 10 of them written by Sian Chandler and Ray Hughes themselves, the other written by Bob Dylan. And when I say that the Black Feathers own compositions stand shoulder to shoulder with Mr Zimmerman's "Make You Feel My Love", then this really is no exaggeration and gives you a good indicator of the strength and depth of their songwriting quality. Rather skilfully, Ray and Sian have utilised some stellar 'names' in the recording of the album (BJ Cole on pedal steel, Phillip Henry on dobro and John Parker on double bass to name just a few), but what is apparent is that their contributions and arrangements are delicately understated, which means that the essence of the duo performance can still shine through without being overshadowed, and that ultimately in the live arena the songs will still stand up as being duo songs rather than band songs. "Soaked To The Bone" begins as it means to go on with opener "Take Me Back", upbeat acoustic rhythm in alliance with alternate lead vocals from both Sian and Ray on the verses. A song about love (maybe not) lost, a familiar and recurring theme throughout, and a veritable cornucopia of riches in the dual harmony department. One of the stand out features of the album, and indeed the Black Feathers as a whole, are the perfectly synced vocals, whether that be lead or in unison. It's clear to see that this is an area where the duo have worked incredibly dog hard, and have succeeded in creating a vocal sound that sparkles and shines in all of it's facets. When Sian, with her incredibly strong yet distinctive slightly lower register, and Ray sing together - that's when the magic happens and that magic is everywhere you look on this album. "Clear Blue Sky" is heartbreak personified - "Tell me you'll forget me not, and I'll be satisfied. I will wish away the rain clouds and dream of clear blue sky". "Goodbye Tomorrow" explores a slightly more introspective theme, while "Arclight" stands out with it's clarity of purpose, a killer line in "Full of your meekness, make me your weakness so I won't go", and simple yet impossibly beautiful 4 word chorus refrain. This album ebbs and flows effortlessly, from the sublimely delicate "Homesick" to the harder edged "Blind" and from the breathtaking acoustic space of "Winter Moves In" to the slightly bluesier vocal inflections of "Spider And The Fly". There isn't a note wasted, nor a word out of place. It's a wonderfully balanced album that immediately insinuates its way into the listeners (sub)consciousness, and at time of writing shows no inclination to leave anytime soon. "Soaked To The Bone" is an artistic triumph for a duo of undeniable talent - and that talent is there for all to see in terms of musicality, vocals and songwriting. Debut albums of this calibre really don't come along that often, but for those who have already experienced a Black Feathers show then it really won't come as any surprise as Ray and Sian have all the attributes that can take them to the very top of wherever they decide they want to go. For now, luxuriate in a stunning listening experience of what, for me, is the album of the year - bar none!